Sygic is serving a whole raft of platforms including Windows CE, Windows Mobile, Microsoft Smartphone, Windows XP/ Vista (yes it can be loaded on a PC and it works) and finally Symbian. Blackberry, UIQ and Linux mobile phone versions are also promised before the end of 2007. I decided to load the "Drive" version (for Pocket PCs) to my Ameo as that device has an 8GB internal hard disk. Some of the maps are quite large. You can decide what you want to pay for, or really need to use. 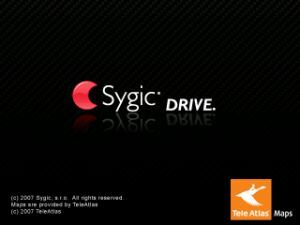 Large selections from individual countries to entire regions are available, and Sygic have used the most up to date release from Tele Atlas for this release, very commendable (the same as shipped with the new TomTom x20 devices). The application installed without a problem, I also copied the Extended Europe map to the Ameo which is a little under 2GB in size. Activation proved interesting as it didn't really do anything so I am not too sure if this actually worked. I could use the device and the software so I simply carried on using it. The only downside was the ''THIS IS TRIAL'' (sic) message in the centre of the display but I could live with this as the trial was time limited. My trial was to run for seven days. However, winding back the calendar date on the PDA extended the trial duration - this is something the developer should note as it should not be this way. If you use another device for appointments and time related duties you can simply roll back the current date and forget about the expiration date. Note that I did this as part of the test but the software and maps have been since removed from the Ameo device. 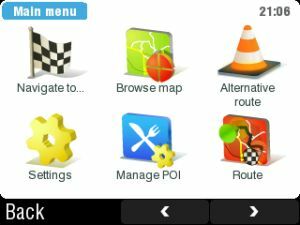 On first switch on the application automatically scanned the ports for the GPS receiver, it correctly found the inbuilt receiver and configured the settings all on its own. You do have the option to manually set this up, but auto worked fine for me, I have known other software fail to find the GPS built in to the Ameo, so a big plus point here. The menu structure and ''feel'' appeared very familiar to me. I wouldn't go quite as far as saying it is a copy of a well known other brand of Satellite Navigation software (the one with the red hands), but it is so very close. This probably explains why I took to the application so quickly though. Perhaps that is a sign that there is one universal HMI design that is the most usable, and Sygic stumbled upon this most intuitive menu structure all by themselves? TomTom have been known to go to court about Intellectual Property Rights (IPR) in the past and I wouldn't be too surprised to see this go the same way. There are certain parts of the Sygic HMI that are somewhat lacking though. For example the absence of full UK postcode search when navigating is a major let down on any modern product. Sure you can enter PR4 1 (you must use the space for it to work though) then you have to select the road and house number. 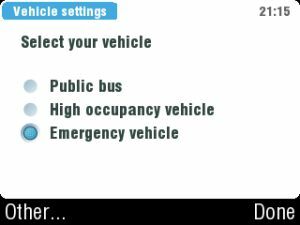 The display when driving offers quite a fair amount of information, whilst remaining uncluttered. 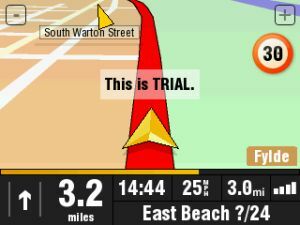 The yellow triangle at the top of the screen actually points towards your destination. This can at times be annoying on the screen since there is no way of turning this off. 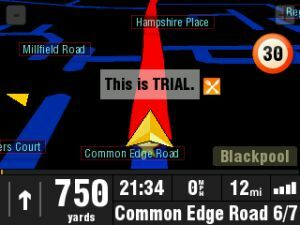 The current road speed as determined by the TeleAtlas maps is shown on the right of the screen. It is quite accurate, but as always obey local road signs as the data is not 100% complete. 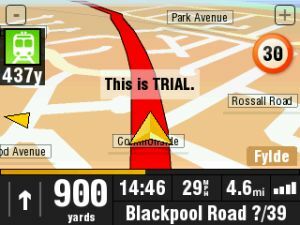 The lower right corner of the map area displays the name of the general area you are in, in this case "Fylde"
Along the lower edge of the screen left to right are your next manoeuvre (in this case straight on), distance to next manoeuvre, current time, current speed, distance remaining, satellite signal reception. On the lower right is the current street name and (where known) the actual house numbers. This I found quite intriguing as it was very accurate, certainly to within a couple of house numbers of reality. Should you exceed the speed limit as defined by the map data you will get visual and audio warning if you select these options from the settings menu. In use I found the audio warning a real pain as a number of local roads have the wrong speed limit assigned to them, using the visual alert worked just as well and still gets your attention if you wander over the speed limit. The visual alert is a simple subtle exclamation mark next to the speed limit indication. Night driving is catered for, too. You have choices of manually selecting day/night colos or automatically letting the software choose. The auto setting worked very well for both dawn and dusk. Secondly you can set different brightness levels for the screen depending upon day or night. The night display is again clear and easy to read. 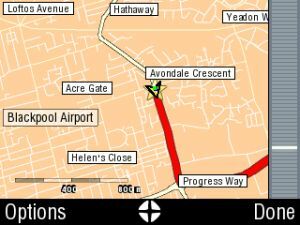 There is the usual selection of 2D/3D and you can choose whether the map automatically zooms in and out or remains at the scale you want. The 2D screen just looked a little washed out to me though because of the missing street outlines. There are a number of in built POI files supplied with the device and the software supports POI Warnings both visual and audible. Whether the software will accept installation of custom POI files is not known as I never found the actual file format to try this. 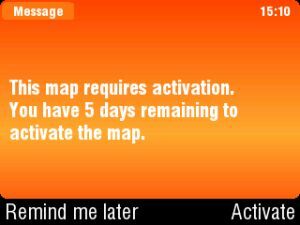 POI warnings appear near the top left corner of the screen, the distance decreases as you approach the item of interest. 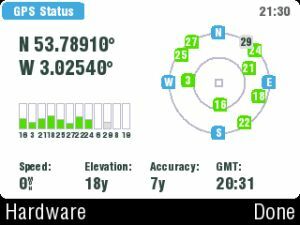 You can create Custom POI categories on the device and add locations to the category, the software will then warn as you approach the location. The inbuilt POI files are the ones supplied by Tele Atlas so they are not too good in terms of accuracy for location or currency. 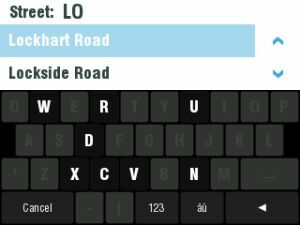 The software uses a form of Text To Speech and other audio files to create the sounds it uses while navigating, it does not read out street names though. With the volume cranked up fully the British Female voice ''Jane'' was too low to be heard, changing to ''Betty'' resolved the volume issue as this choice is quite a bit louder. At times this voice was little shrill though. I did find the option to limit the maximum volume a nuisance, once this was set to 100% the sounds were much easier to control. 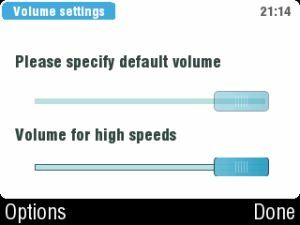 I fail to see why there are two volume settings - one for the sound level and the other one adjusts the actual volume available when the other is set to 100%. This is not really much use and will cause confusion to the user. The software does recite the actual road number you are on so it will say ''B Two Thousand ---- And --------Fifty ----------Three''. It takes around 8 seconds for it to spit out the numbers as words. I would prefer to switch this off as it is so annoying and of little practical value when the road number is on screen anyway. Alas, there is no option to turn this off. The Text-to-Speech engine either needs speeding up in operation, or it should give the user the option to disable it. There are very long pauses between each number, and these pauses also vary in duration. The overall duration is simply too long, to the extent that when it has read out the fourth numeric value you will have forgotten the first two! This is negating the usefulness of the road numbers by audible methods entirely, and is distracting you from you primary duty of safe driving whilst using the sat nav package. 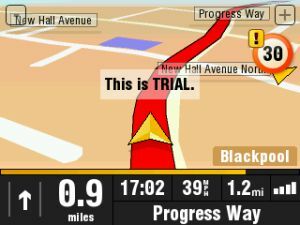 I first used the Sygic application on my daily commute route to the office. I followed its instructions only for it to lead down some roads that would have damaged the vehicle. Routing produces the most surprises I have ever seen from any navigation software. Out in the country it tries to use dirt tracks and un-surfaced roads as part of its route, while in built-up areas it goes for back alleys and other small narrow passages. This can be partly explained by the fact these unrealistic roads are in the map data, however most other software packages ignore them, so the application must take some criticism for this. 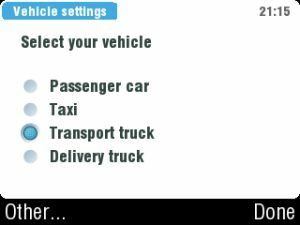 There are a number of vehicle types to select so I next tried it set to truck mode and it still produced equally stupid routes - it is this sort of application that gets the industry a bad name, I simply don't trust the software to get me down navigable roads in a normal vehicle. 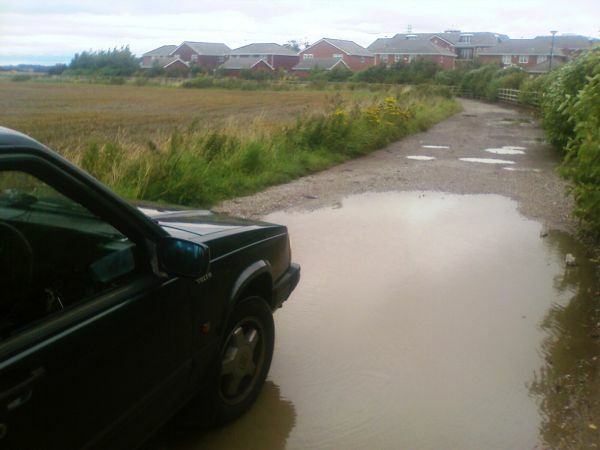 It was set to truck mode when it again sent me ''Off Road'' I got partially stuck and had to reverse out for about two thirds of a mile. Blocking my exit to the main road was a Police car. The officer thought I had been ''Fly Tipping'' but a short check in the car proved I was actually testing some GPS related equipment. He saw the funny side and let me go on my way. I should say that I only went down the particular road to grab some pictures, I would never normally drive down an unsuitable road as it is just as easy to ignore the routing and let the device try again. That said my confidence in the application to produce reliable routes was somewhat shattered by now! The next bizarre occurrence was heading through the outskirts of Preston to the motorway. I was told to turn right and it led me straight though and around the city centre - almost like a guided tour, before heading back to the road I was previously on. This added five miles to the trip and only put me back on the same road I was previously on less than one mile further down it from where I left it in the first place! I always select fastest route so I am somewhat at loss as to why the software behaves this way. It is certainly unique and in a class of its own when it comes to routing, sadly this class is not capable of passing any exams though. The maps are great with little if any secondary detail missing, the HMI is easy to use and intuitive. The screen is uncluttered and has a decent choice of colours and contrast. 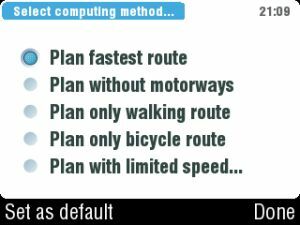 BUT the routing engine is unreliable and for this reason alone I simply would not recommend this application. Also the omission of full postcode search for the UK is a major hindrance these days. If Sygic sort out the routing and give an option to turn of the road number pronunciation I would be considerably happier.